The use of radial access for catheterization and cardiac intervention is becoming more popular, due to its lack of complications. Radial artery pseudoaneurysm (RAp) is an extremely rare complication, and hence, many of its clinical features are unknown, and treatment is not systematic. In the few reported cases of RAp, surgical repair was the most commonly used treatment, although recently there have been reports of successful nonsurgical treatment in patients. 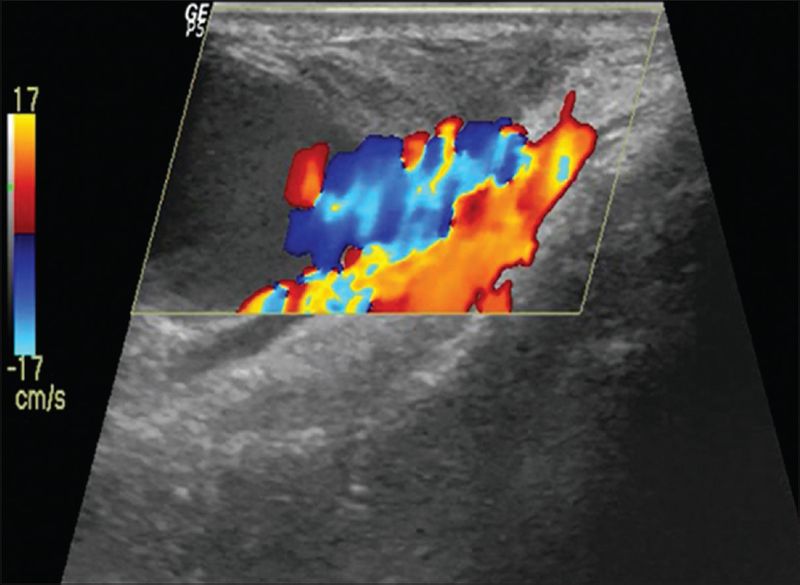 We report a case of 70-year-old female who had large radial pseudoaneurysm which was managed conservatively with the ultrasound-guided compression. A 70-year-old female patient presented to our hospital with the complaints of chest pain for 1 week duration suggestive of unstable angina. She is a known type 2 diabetic patient on irregular treatment. She was admitted. Coronary angiogram was done through the right radial artery. Radial artery puncture was done by Jelco needle with a single puncture and 5F sheath was secured in place. Patient's coronary angiogram showed double vessel disease. (significant left anterior descending and obtuse marginal) which was planned for double vessel angioplasty. The patient was loaded with dual antiplatelet therapy (aspirin 300 mg and clopidogrel 300 mg) with heparin of 5000U. Hemostasis was achieved completely after the procedure by using TR band with 11 cc of air for compression. The TR Band was deflated as per protocol over the next 2 h and discontinued. There was forearm ecchymosis and hematoma noted on removal of the TR Band, without oozing or tenderness to palpation. Next day, patient complained of right wrist swelling with the extension of swelling with ecchymosis [Figure 1] and [Figure 2] in the dorsum of the right hand despite ice-cold compression and limb elevation [Video 1]. 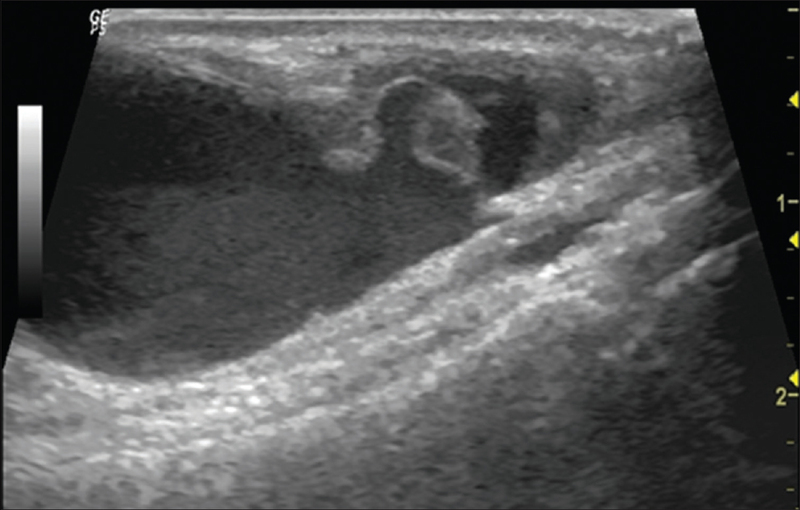 An ultrasound of the right wrist demonstrated a pseudoaneurysm (PSA) of the radial artery with a communicating channel between the aneurysm and the radial artery [Figure 3] and [Figure 4]. Ultrasound-guided compression was given for 45 min over the communicating neck between the radial artery and PSA for 3 days. After 3 days, the swelling and ecchymosis completely disappeared. Serial subsequent ultrasounds confirmed successful treatment of the radial PSA with preserved radial artery flow. PSA is described as a tear through all the layers of the artery with resultant hemorrhage and hematoma formation contained by the surrounding tissue creating a false sac. PSA with TR access is rare, with <0.1% incidence reported in a large case series. There are several factors that predispose TR access to the development of PSA, including multiple puncture attempts, ongoing systemic anticoagulation, inadequate hemostasis or postprocedure compression, vascular site infection, and the use of larger sheaths. RAp is a very rare complication but potentially harmful one due to the risk of external bleeding because of the rupture of its fragile outer wall. The appearance of an internal bruise on forearm after the initial compression is an important sign that alert us about the possibility of a subsequent RAp development, especially if the patient was anticoagulated and if big sheaths were used during the procedure. A nonsurgical approach is an effective strategy, starting initially with mechanical compression and if this fails, use a thrombin injection. However unlike femoral PSAs, we should avoid the direct compression of the RAp to avoid the RAp rupture. We recommend performing a radial artery compression but proximal to the RAp. If the patient does develop radial artery RAp, we recommend conservative treatment initially (without anticoagulating the patient, if possible) using compression with a pneumatic device TR bandage applied against the radial artery proximally to the RAp and not directly against the RAp (as is done currently, imitating the treatment of femoral RAp). By this way, potential iatrogenic rupture of the RAp is avoided. This proximal compression should be fully occlusive. Due to the possibility that blood may enter the RAp through the palmar arch via the ulnar artery, the absence of flow in the RAp should be verified by vascular ultrasound, or if not possible, by palpation by the absence of pulsatility. We then recommend using a finger to apply direct but mild compression against the RAp to expel the blood from the cavity into the radial artery and collapse it. Surgery should be considered for cases if the conservative management strategy has not been effective. A nonsurgical approach is an effective strategy, starting initially with mechanical compression and if it does not work use a thrombin injection. However unlike femoral PSAs, we should avoid direct compression of the RAp prevent rupture. RAp is a rare complication (0.1%) but potentially harmful one due to the risk of rupture. The appearance of an internal bruise on forearm after the initial compression is an important sign that should alert us about the possibility of a subsequent RAp development. A nonsurgical approach is an effective strategy, starting initially with mechanical compression and if this fails, to use a thrombin injection. Nonoperative management of uncomplicated PA of the radial artery is a safe and valuable treatment strategy that may be useful. Compression bandage provides a simple, noninvasive, and cost-effective procedure which may be first-line treatment for radial PA.
Matthew P. Cauchi DO, Paul M. Robb, MD, Robert P. Zemple, MD, Timothy C. Ball, MD, PhD J Ultrasound Med 2014; 33:1505–9. Available form: www.aium.org. [Last accessed on 2017 Jul 01]. Rodrı´guez-Olivares R, Garcı´a-Touchard A, Ferna´ndez-Dı´az JA, Oteo JF, Zorita B, Goicolea J. Abordaje transulnar con arteria radial homolateral ocluida: descripcio´n de la vascularizacio´n del antebrazo y seguimiento a largo plazo. Rev Esp Cardiol 2014;67:854–5. Cozzi DA, Morini F, Casati A, Pacilli M, Salvini V, Cozzi F. Radial artery pseudoaneurysm successfully treated by compression bandage. Arch Dis Child 2003;88:165-6. Kerr CD, Duffey TP. Traumatic false aneurysm of the radial artery. J Trauma 1988;28:1603-4. Collins N, Wainstein R, Ward M, Bhagwandeen R, Dzavik V. Pseudoaneurysm after transradial cardiac catheterization: case series and review of the literature. Catheter Cardiovasc Interv 2012;80:283-7. doi: 10.1002/ccd.23216. Kiemeneji F, Laarman GJ, Odekerken D. A randomized comparison of percutaneous transluminal coronary angioplasty by the radial, brachial, and femoral approaches: the access study. J Am Coll Cardiol 1997;29:1269-75. Radial Artery Pseudoaneurysm Following Cardiac Catheterization: Scientific letters. Rev Esp Cardiol 2015;68(4):343-54. Available form: http://dx.doi.org/10.1016/j.rec.2014.11.013.